Katya’s not yet 16 when she receives her apprenticeship to become a navigator on-board her uncle’s submarine, Pushkin’s Baby. On her first voyage as an adult, the Feds bring a prisoner on-board, demanding they change their course to suit his needs, taking them through the unpredictable Weft. What starts off as an annoyance soon turns life-threatening; there is something out there, something unidentifiable and Katya may never get to see her 16th birthday. You may be forgiven for thinking Katya’s World is set against a back-drop of Soviet Russia, at the height of the cold war when submarines lurked everywhere. But no, it is set off-world on an ocean planet, Russalka, populated by descendants of Russia, sent there to colonise a seemingly inhospitable environment. Whilst some live on surface platforms, the weather is hostile and most inhabitants live underwater, in pressurised communities which keep the sea out. The world is succinctly introduced in a preface, answering many of the questions that may otherwise get in the way of the story (like why they’re all from Russia). So for the alien location the setting seems comfortingly familiar and if you’ve ever enjoyed a submarine based film, give Katya’s World a go. With the scene quickly set, it’s really about the story. 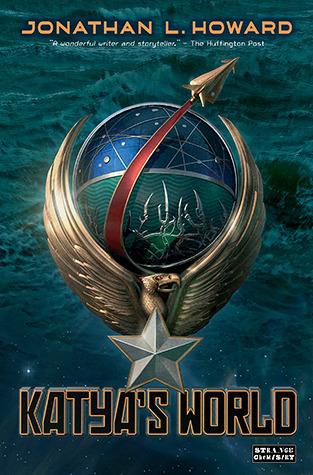 There’s feds and pirates and crew just trying to do their job; a world getting by after a war with Earth which may not be as over as everyone thinks. Plus there’s plenty of secrets and double-crossing like any good adventure. You might want to sit down for this but… there is no romance. Not one jot and it doesn’t suffer for it! I know, there are other young adult books without a love interest but it is something that seems to be expected, especially with female protagonists. Instead there are subtle platonic relationships, both with her uncle and her emerging friendship with Kane. A boy would have just got in the way and seemed contrived. Who has time for flirting when you could be crushed by an ocean any minute? Although is it still an ocean when the whole planet is sea? The highlight for me was the Leviathan. I can’t go into too much detail without giving away spoilers. Whilst it was ever present throughout the novel, I did want it to go into a bit more depth, especially when we find out its true nature. I suppose it is for a young adult audience and it could get all a bit disturbing but many of the actions are very grown-up and there is a real dark side. Katya's World is published by Strange Chemistry and is now available in paperback and ebook formats. Thanks go to the publisher for providing a copy for review. I read this a while back and really liked it. A return to 'proper' sci-fi as it used to be. Now this is what the YA community needs---something new, fresh and lacking in romance! The premise is unique enough to keep me intrigued and wanting to know more. I will definitely be adding this to my TBR pile, for sure!